Upset with remarks made by Mitt Romney during the debates leading up to this month's South Carolina Republican primary, Jefferson icon Bigfoot last week released a statement to Jefferson Iowa News. In it he attacks Romney for his claim that Newt Gingrich aired an ad by a SuperPac that "attacked me, with probably the biggest hoax since Bigfoot". Bigfoot's statement basically pointed out that after Mitt's comment, he dropped like a rock in the polls, eventually losing to Gingrich by double digits. He also added, "Romney against National Health Care? - Now there's a hoax!" We thought that it would be appropriate to get some follow-up remarks, so JIN sent Rick Bland, Tars Tarkus, and yours truly on a mission to locate Bigfoot's current home. We started at Spring Lake, arriving at dusk. After walking around the lake for awhile, we came upon an old gypsy wagon camped out in an isolated part of the park with an old gypsy woman inside. We asked her if she had seen Bigfoot, and she responded by pointing two fingers at her eyes and then at Rick Bland. Rick proceeded to spend the night ridiculing her and throwing empty beer cans at her wagon. In the morning, we had to take Rick to the hospital, as he had developed a goiter under his chin the size of a football. We searched the wooded areas all afternoon. We found deer and rabbit tracks, and possibly some sasquatch heel prints. 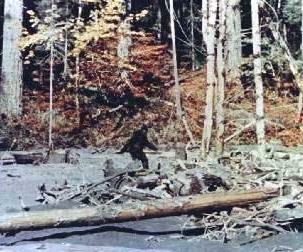 They were near the lake, which is exactly where you would expect sasquatch prints to show up. That night we heard many possible sounds of sasquatch movement, but nothing definite. The next day we pulled up stakes and headed toward Seven Hills Park. On the way, we paid a visit to Rick, who was still at the hospital. If anything his condition had grown worse. As his doctor stated, "I don't think I've ever seen this before, but inside his scrotum, his testicles appear to be tied in a knot." Once at Seven Hills, we selected a campsite near a cluster of trees growing in a somewhat irregular manner. This would be typical of the type of tree cluster where you may find sasquatch. We did not notice any overturned trash cans or large droppings which would have indicated Bigfoot's presence, so we chose to wait until midnight to begin our search (sasquatches being nocturnal in this area). Although none of our sasquatch calls were returned, we noticed an abundance of rabbit tracks, which are almost always found in the vicinity of sasquatch. Closer observations seem to indicate that the sled run has probably recently been inhabited by sasquatch - seems to be a very squatchie location, with large piles of trash and feces. Even though we did not hook up with Bigfoot on this particular trip, we intend to monitor this area and will hopefully be able to report contact in the near future.